Over the years, most of our posts about our various jaunts have covered our exploits around the European shores of Istanbul. But, Istanbul also has an Asian side – well you know it’s that famous place in the world (we refuse to type out any of any of those clichés) where you can be on one continent, one minute (Europe), and another continent the next (Asia). One stretch of water divides the two halves of the city (and, yes, the two continents); the Bosphorus Strait. Soooo, do yo have to make a choice about which continental side of the city to visit at any given time? Noooo, of course not. That’s the wonderfully special thing about Istanbul – and it’s what we love most about this city…the Istanbul ferry! What a fabulous way of traversing a city. Commuters, shoppers, tourists; the Istanbul ferry routes carry the city’s millions from point to point…with scenery that any cruise ship enthusiast would, and do, pay a small fortune for. It’s the perfect way to travel around a city that is famous for being overcrowded. 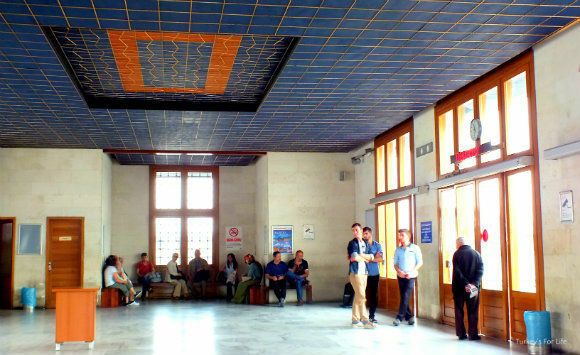 A short wait in the waiting room (we’d got there early, hence the lack of people in the photo) that slowly fills to almost bursting-at-the-seams levels, and then the Eminönü to Kadıköy ferry pulls in and docks. The doors open and we stream onto our Istanbul ferry. No need for scrambling around and pushing and shoving. The IDO Şehir Hatları ferries have oodles of room for us all. Straight up to the top deck for the best views – obviously it helps if the weather is behaving! We’ve got Yeni Camii (the New Mosque) on our shoreline and Beyoğlu opposite; Galata Tower standing proud and tall amongst the more recent developments of the building world. Up there, around the tower, daily life in Galata is taking place…but we’re on the water. We’re watching all from afar. And as soon as the last passenger scurries aboard the Eminönü to Kadıköy ferry, the barriers are put in place and we’re off. This is a short commute across the bend of the Bosphorus but it’s already like being on a day trip. 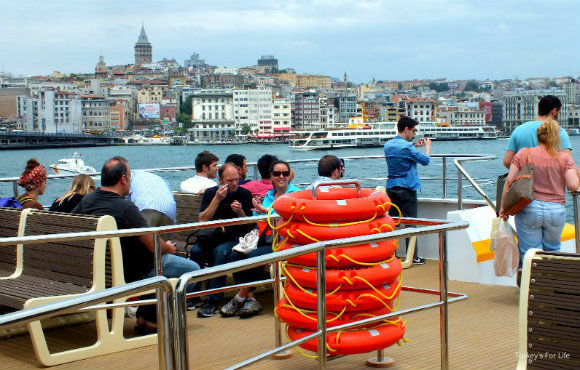 There are Istanbul ferry routes galore that you can just try at will and use them to explore the city. The Eminönü to Kadıköy ferry is one of our favourites, though, just for the cityscapes (don’t forget your camera on this little jaunt across the water) and for what’s waiting at our destination. Because, one thing in particular that the journey from Eminönü to Kadıköy by ferry creates for us is stupendous views of Sultanahmet. At one point, we’re up close and personal with Topkapı Palace, but from a whole different angle. And, as we sail further away from the shore, there they are; three of the world’s most famous buildings in full panoramic glory. Topkapı Palace is joined by Aya Sofya revealing its true majesty and a rare view of the six minarets of Sultanahmet Camii (the Blue Mosque). Yes, dear reader, you can only see 5 and a half minarets in this photo – the delights of repairs and restoration. Ahh, the curving, sweeping wake of our Eminönü to Kadıköy ferry and another panoramic cityscape. A cruise ship docked at Karaköy and criss-crossing vessels, plying the various Istanbul ferry routes and carrying the masses of tourists on the Bosphorus cruise. The Bosphorus waters are rarely calm – too many cargo ships for that – but our Eminönü to Kadıköy ferry is made of sturdy stuff, cutting through the waves that slap against hull. We barely even rock. And, after around 15 minutes of fresh sea breezes, lots of photographs, “no thank you,” to the çay and simit seller (well, we’re too busy with camera, right now), we pull into the calmer waters of the harbour that leads us to Kadıköy. We pass the more familiar sight of the traditional Şehir Hatları Istanbul ferry making it’s way back from Kadıköy to Eminönü. Because you see, things are changing around here. We pull into the iskele at Kadıköy and disembark. We were on a Şehir Hatları Istanbul ferry…but it was a new one. Wow, what to make of this. These traditional ferries are a part of Istanbul’s scenery, it’s make up. And yet, once onboard this new style Istanbul ferry, it still resembled the older models…just more shiny and new. We need new in the world, but we need old and familiar, too, so here’s hoping for a mixed fleet of traditional and modern. 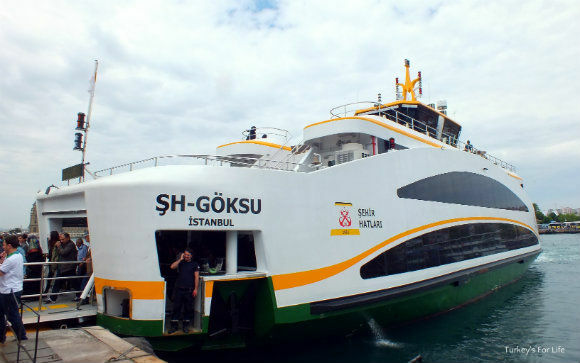 We’re sure the famous, traditional Istanbul ferry isn’t past its sell by date just yet! Although they’re fab to use as little outings and day trips in themselves, the Istanbul ferry is just a part of the city’s public transport system. If you’re planning on doing lots of independent wandering around the city, get yourself an Istanbul Kart and the Istanbul ferry routes cost just over a couple of lira per journey. You can use this prepaid card on buses, metro and funicular, too. If it’s a one-off journey and you don’t want to get an Istanbul Kart, you’ll need to buy a jeton (token) for around 4 TL at the iskele (boarding point). This particular Istanbul ferry route from Eminönü to Kadıköy takes around 20 minutes. You can also sail to Kadıköy from Karaköy (on the opposite side of the golden Horn to Eminönü). The Eminönü Kadıköy ferry is every 20 minutes. If you’re planning on sticking around Kadıköy to enjoy some nightlife, check the time for the last ferry back if you don’t want to be faced with a potentially pricey taxi journey. We’ve made the trip back from Kadıköy to Eminönü at nighttime, too. Highly recommended! There is a snack shop on the ferries and there will also be vendors selling çay and simit should you want a really leisurely sail. You can book hotels in Eminönü, Kadıköy & everywhere else in Istanbul through Booking.com. I totally agree. The ferries are one of the wonderfully special things about Istanbul. And the best place to drink sweet tea, share a simit with a seagull and watch the dolphins play. 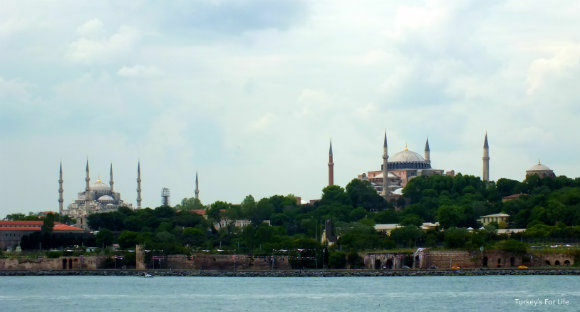 I love the ferries of Istanbul too and think they are the cheapest fun thing to do in Istanbul, and the views are superb. I look forward to your follow up posts. Thanks budget jan. 🙂 Yeah, particularly love the Eminönü Kadıköy ferry because you arrive in Kadıköy at the other side. Posts will be from there. That’s what we always think, too, Joy, and so cheap and ‘airy’ too. 🙂 Never been on the Beşiktaş to Üsküdar ferry, strangely. We can put that right though, once we’ve covered the Eminönü Kadıköy ferry route.